The Sierra Nevada Landscape Wall Tapestry depicts the painting by Bierdstadt of California's Sierra Nevada that he painted in 1868. This painting toured through Europe to St. Petersburg, fueling Europeans' interest in emigration. Buoyed by glowing reviews, Bierstadt then offered the painting to American audiences who could take pride in an American artist's skill and in the natural splendors of their young nation. Made in the USA. 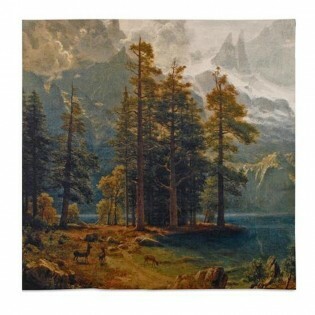 The Sierra Nevada Landscape Wall Tapestry depicts the painting by Bierdstadt of California's Sierra Nevada that he painted in 1868. This painting toured through Europe to St. Petersburg, fueling Europeans' interest in emigration. Buoyed by glowing reviews, Bierstadt then offered the painting to American audiences who could take pride in an American artist's skill and in the natural splendors of their young nation.